대방광불화엄경 진본 권66(大方廣佛華嚴經 晋本 卷六十六)은 당나라의 실차난타가 번역한『화엄경』주본 80권 중 권 66의 내용으로 나무판에 새긴 뒤 닥종이에 찍어낸 것이다. 형태는 종이를 길게 붙여 두루마리처럼 말아서 보관할 수 있도록 되어 있으며, 펼쳤을 때의 크기는 세로 29.2㎝, 가로 1,138.1㎝이다. 글씨체, 형식, 정교한 새김, 먹 색깔, 인쇄상태, 종이의 질 등이『화엄경』진본 권37(국보 제202호)과 비슷하여 고려 숙종 때인 1098년을 전후하여 만들어진 것으로 보인다. 이 책은 고려 전기 목판인쇄술 및 화엄경의 판본연구에 있어 중요한 자료로 여겨진다. Daebanggwangbul Avatamsaka Sutra is otherwise called Avatamsaka Sutra for short. It argues that Buddha and the multitude are one. 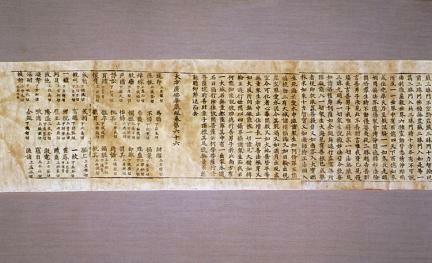 This and the Lotus Sutra are the first two canons of the Avatamsaka sect that had the greatest influence on the establishment of Buddhism in Korea. 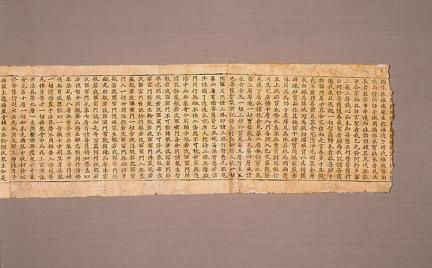 This is the 66th of the 80 volumes of the main text of the Sutra, translated by Silchananta of the Tang Dynasty. The letters were made into wood blocks and then printed on paper, and the papers were connected to form a paper roll. It is 29.2 cm in length and 1,138.1 cm in width. The style of letters, engraving skills, the color of ink and the quality of paper are all very similar to the Jin Version of Avatamsaka Sutra (National Treasure no. 202). It is believed to have been produced around 1098, during the reign of King Sukjong of Goryeo. It is an invaluable material for the study of wood-block painting in early Goryeo.